For the egg mayonnaise, boil the eggs for about 4 minutes, cool in iced water, peel and chop mix in the mayonnaise and season, reserve. Add another layer of toast and press down gently, place on the cured ham followed by the caper mayonnaise and top with the tomato, season lightly. Finally top with the 3rd layer of toast, press down lightly. Cut into quarters and place a bamboo skewer through your sandwich quarters to keep them together. 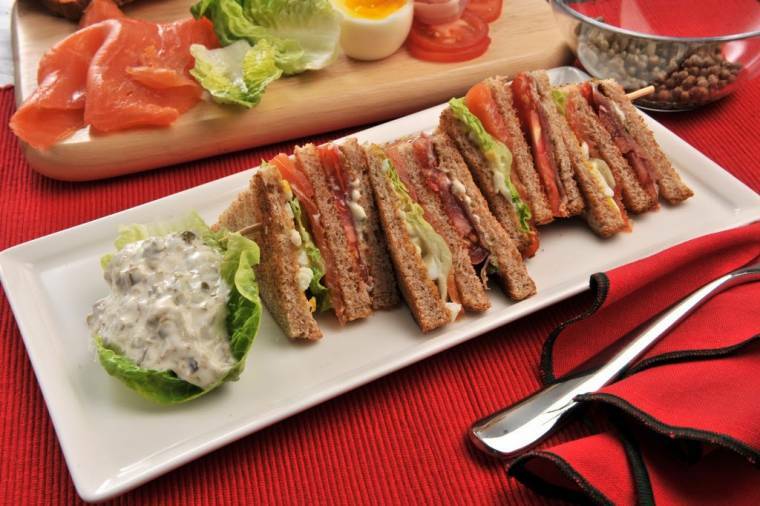 Fancy trying this Smoked Salmon Club Sandwich? Do not forget to share your thoughts in the comments below. Try now or pin for later. "Lentil Dahl with Spiced Onions…." "Creative Mondays Blog Hop Week 3 : Brunch Bars…." These look fantastic. Husband would be thrilled with them for a Saturday lunch (or anytime :-)). I am a sucker for sandwiches. The only meat I eat is fish. I'm going to have to try this one. It sounds good.